Stamp orders placed before 11am EST will be manufactured and shipped the same day. Ships Monday, 04-22-2019. Choose USPS Priority for delivery in 3-5 days. 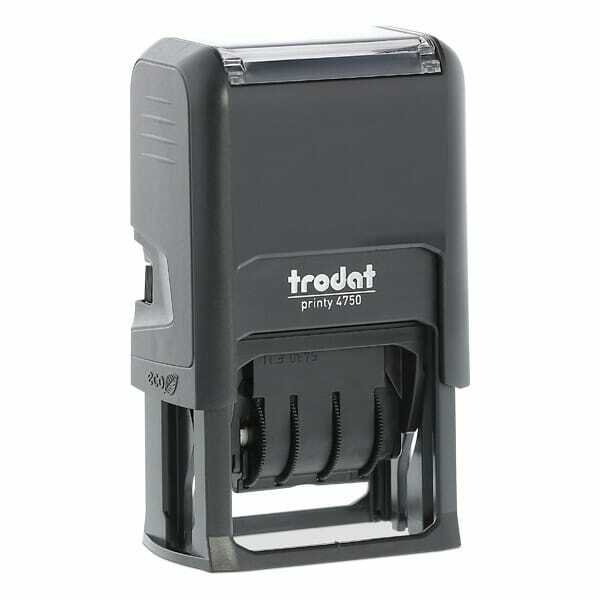 Trodat Printy 4750/4L comes with four itnterchangeable messages: RECEIVE, ENTERED, PAID and FAXED. The stamp has an impression size of 1" x 1-5/8" (24 x 41 mm) and the message prints in blue. The 5/32" (4mm) date prints centrally in red in the format: month (in letters) day and 12 consecutive years in figures. The 4750/L is a climate-neutral prodcut made with maximum possible amount of recycled plastic, and an investment in climate protection projects. Running low on ink? To further extend the life of your self-inking stamp, use replacement ink cartridge 6/4750/2. Customer evaluation "Trodat Printy Dater 4750/4L - RECEIVED, ENTERED, PAID, FAXED"
Custom Engraved Sign/Wall Holder Complete- Traditional 2" x 8"
* All prices displayed are excluding sales taxes. Final charges are displayed at the checkout page. Subscribe to the free getstamps.com newsletter and ensure that you will no longer miss any of our offers or news.